vapor deposition allows researchers to measure, witness, and potentially manipulate electrons in a manner that could lead to new “quantum technology” for information processing. Normal computers process bits, the fundamental ones and zeros, one at a time. But in quantum computing, a “qubit” can be a one or a zero at the same time. This duplicitous state can allow multitasking at an astounding rate, which could exponentially increase the computing capacity of a tiny, tiny machine. An “NV-“ center can be created within a diamond’s scaffold-like structure by replacing a missing carbon atom with a nitrogen atom (N)that has trapped an electron making the center negatively charged. Scientists can monitor the center’s behavior and thereby provide a window for understanding how electrons respond to different conditions. The center has the potential to serve as a qubit in future quantum computers. Electrons occupy different orbits around their atom and, by analogy, spin like the Earth. 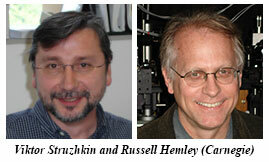 Carnegie scientists Viktor Struzhkin and Russell J. Hemley, along with colleagues from the Austrialian National University, the University of Melbourne, and the University of Ulm observed what happens to electrons in these NV- centers under high-pressure and normal temperatures. Their new technique offers a powerful new tool for analyzing and manipulating electrons to advance the understanding of high-pressure superconductivity, as well as magnetic and electrical properties. 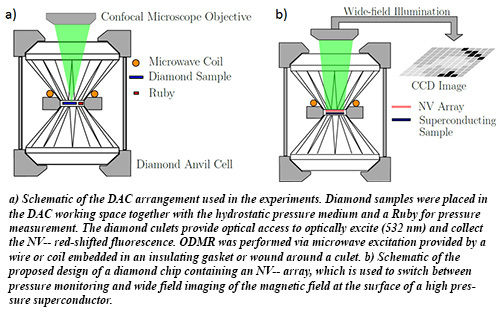 The team subjected single-crystal diamonds to pressures up to 600,000 times atmospheric pressure at sea level (60 gigapascals, GPa) in a diamond anvil cell and observed how electron spin and motion were affected. They optically excited the NV- centers with light and scanned microwave frequencies in a process called optically detected magnetic resonance to determine any changes. The NV- center is very sensitive to magnetic fields, electrical fields, and stress. Until now, researchers thought that the orbits of the electrons that contribute to the defect’s electronic structure and spin dynamics were localized to the area immediately surrounding the vacancy. The team found instead that the electrons also orbit more distant atoms and that the span of their orbits contract with increasing pressure. In addition to overturning previous beliefs about the electron orbits, the researchers found a sensitive means to measure pressure. This method can detect changes in pressure of about 10 atmospheres in one second, even up to pressures of 500,000 atmospheres (50 GPa). This work demonstrates that defects in diamond have great potential as quantum sensors of high pressure phenomena and, conversely, that high pressure can be employed to study the quantum phenomena of the defects [M. Doherty et al., Phys. Rev. B. 112, 047601 (2014)].